Four wheels are better than none. 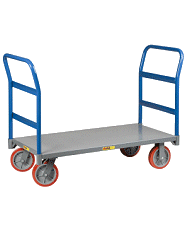 Platform Carts can help transport a lots of product or even oversized equipment. Save time with the right platform cart for your application. Get your platform cart today! B & P Tread Plate Platform Cart 36" x 24"
B & P Smooth Deck Platform Cart - 36" x 24"